The future of human flight is soaring in a clear direction: electric aviation. That's the assertion of the experts at Beta Technologies, a South Burlington startup that's built what could be one of the most innovative aircraft ever to take to New England skies. Beta's eVTOL, or electric vertical takeoff and landing vehicle, combines the flight characteristics of a helicopter, drone and fixed-wing airplane with cockpit and control systems that revolutionize the pilot's interface. Spoiler alert: That description of the experimental plane, which has already been built and test-flown at New York State's Plattsburgh International Airport, is all the company will reveal publicly before the craft's formal unveiling in 2019. That said, visitors to Beta's booth at this week's Vermont Tech Jam might get the opportunity to see a flight simulator and model cockpit. Why is Beta's eVTOL in stealth mode? Not to protect trade secrets, said its developers. Currently, both the mainstream media and industry publications publish stories almost daily about eVTOL and electric aircraft, according to Beta's chief operating officer, Tom O'Leary. Given that anticipation is already high, Beta leadership wants to focus on producing a finished product, not on giving tours and interviews. Still, questions abound: Is the plane being built for a commercial carrier? A cargo company? A car service such as Uber or Lyft? An air ambulance service? The company won't comment, except to say that the craft will be for civilian use and that the project is not funded by venture capital. Beta's experimental aircraft is the brainchild of company founder Kyle Clark. It's not the first Vermont startup for the 38-year-old engineer, inventor, pilot and entrepreneur. Among his previous projects was Designbook, which helped entrepreneurs launch, develop and crowdsource funding for their projects. Clark is a motorcycle and aviation enthusiast who designs, builds, drives and flies experimental vehicles of all kinds. He's assembled an all-star team of electrical and mechanical engineers, software designers, and aviation industry experts to build this plane. Launched in the spring of 2017, the project went from initial concept to "wheels off the ground" in just 10 months, Clark said. That time trajectory is virtually unheard of in the aviation industry. "Everything we do is focused on rapid development," explained O'Leary, who offered a reporter a peek into the company's headquarters in a Horizon Air hangar at Burlington International Airport. Like others on Beta's team, O'Leary is a tech industry veteran; he previously was chief customer officer at Burlington's Dealer.com and, before that, general manager of sales at what was then Tesla Motors in Palo Alto, Calif.
After walking past a half dozen conventional aircraft, we entered Beta's lab. There sat several scale models of the plane, a battery-charging station and a full-size wooden mockup of the cockpit, outfitted with a virtual reality headset. Clark was taking measurements on one of the scale models, which was about the size of a Ping-Pong table and resembled a huge balsa-wood model plane. Meanwhile, a 3D printer fabricated new parts for the flight deck. In its effort to produce a viable electric aircraft, Beta's team shows sky-high ambition. This small Vermont-based startup, which just incorporated in July and has 21 full-time employees, aims to soar past other aerospace industry giants, including Boeing, Airbus, NASA and the U.S. military's Defense Advanced Research Projects Agency. All have been working on battery-powered airplanes for years and have poured tens, if not hundreds, of millions of dollars into the effort. Early prototypes have already been unveiled, though none is yet in mass production. What's the company's plan for success in that competitive environment? As O'Leary pointed out, Toyota and General Motors had electric car programs in the works for years before Tesla became the electric car industry leader. As he put it, "We don't need to unlearn bad habits or ways of thinking about aviation." The company can also take advantage of technology that didn't exist a decade ago, O'Leary explained, which makes it possible to bring concepts rapidly from the drawing board to testing. Beta's designers can conceive of a new part in the morning, use CAD software to design it, send it to a 3D printer and implement it on a scale-model prototype the same afternoon. "Ten years ago," O'Leary said, "that cycle would have taken us a month." Consider Beta's combined cockpit and flight deck. Beta hired a Vermont craftsman to build it out of wood in a few days, then plugged off-the-shelf electronics into it and installed other parts hot off the printer. "Now we have a feel for what this cockpit is going to look like," O'Leary said. "We throw a VR headset on it, and all of a sudden we're experiencing flight in a matter of two months after we designed it." The race to develop electric planes reflects a sense that the aviation industry's transition from fossil fuels is long overdue. 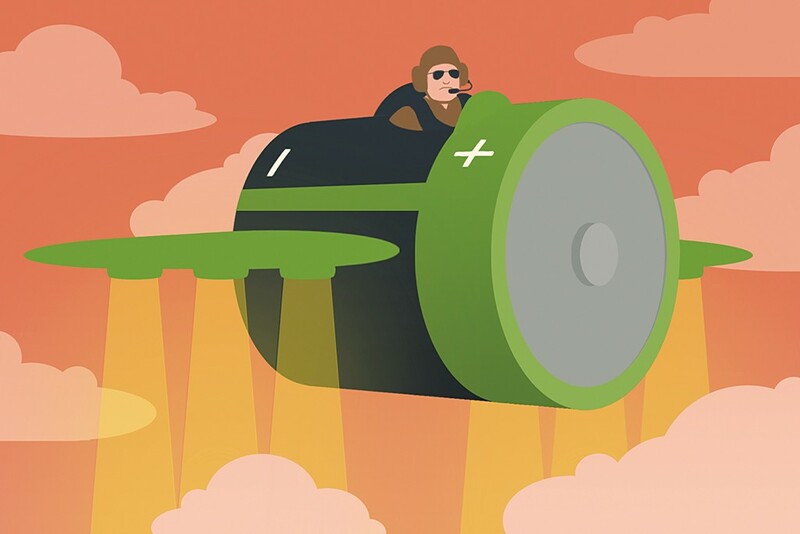 According to the Environmental Defense Fund, aviation is one of the fastest-growing sources of global greenhouse gases, with the airline industry alone accounting for 2 to 3 percent of all human-created CO2 emissions. If the aerospace industry doesn't alter its current rate of fuel consumption, its greenhouse gas emissions are projected to triple by 2050. For various reasons, electric-powered propulsion and control systems offer clear advantages over combustion engines, Clark said. The "energy density," or extractable energy, of current battery technology can't yet carry a full-size passenger plane from coast to coast, but it's getting there. Batteries' power and energy efficiency are increasing at a rate of 5 percent per year, Clark said, while those of jet fuel engines have essentially "flatlined ... so the parity point is coming." Electric planes also will be cheaper to operate, Clark added. As of last week, jet fuel was selling for $5.64 per gallon at BTV. "That 429 out there," Clark said, referring to a Bell helicopter in the hangar, "will cost $3,600 an hour to operate. The aircraft we're developing ... will cost somewhere around $100 an hour." Electric motors offer other advantages over combustion engines, Clark continued. Because electric motors have fewer moving parts, they can go dramatically longer between component overhauls: A Beta aircraft can go about 10,000 hours; a conventional helicopter, only 1,000 to 3,000. And electric aircraft are safer. Without hundreds of gallons of jet fuel on board, a plane is far less likely to catch fire in a crash. Electric motors excite Clark for another reason: They've enabled him to build a "fly-by-wire" system that operates the plane with wired, and even wireless, controls, eliminating the need for mechanical moving parts. When Clark was getting his bachelor's degree at Harvard University, he was awarded the 2004 Engineering Thesis of the Year for his work on flight dynamics and control algorithms. The control systems in Beta's aircraft, which he's been imagining for 15 years, allow the pilot to operate the plane more intuitively, such as by leaning in one direction or another to steer, bank and climb. So, has he flown it yet? "Oh, yeah!" Clark said with a huge smile. "That's the grin." Clark's contagious enthusiasm for the project has attracted senior tech industry veterans from Vermont and beyond. Steve Arms is founder of what's now LORD Sensing-MicroStrain in Williston, which builds sensors used in everything from bridges to robotics to helicopters. Arms, who sold his company to LORD in 2012, heard about Clark's project via word of mouth and joined the team in November 2017. He's now using sensing technologies and software developed at MicroStrain on Beta's aircraft. Arms, one of four former MicroStrain people who've joined Beta, described Clark as "indefatigable" and a "roll-up-your-sleeves-and-get-it-done" kind of guy. "Kyle can manage so many things at the same time [and] makes it look easy," Arms said. "It's wonderful and very inspiring to the team." Another key hire was Artur Adib, a well-known name in Silicon Valley, who was a senior software developer at Twitter and Mozilla and a researcher at New Mexico's Los Alamos National Laboratory. Adib said he's actually found it advantageous to work in Vermont rather than Silicon Valley. "You avoid thinking like they do," he said. "If you're constantly surrounded by the same people talking about the same things all the time, there's a lot of groupthink that goes on. We don't have that here." Adib cited another advantage to being headquartered in Vermont: easier access to the state's congressional delegation, the airport's leadership and, by extension, its Federal Aviation Administration staff. All of them, he noted, have been extremely supportive of this project. Both Adib and Arms pointed to a perk of working at Beta: Because all of the team members need to understand the language, mechanics and physics of flight, Clark hired local flight instructors to train them to become licensed pilots. That's a new skill for Arms, though he used to fly with his father in the 1970s and '80s. Climbing aboard the Cessna 172 trainer, he said, was "like stepping into a time machine. It looked like my dad's plane and even smelled like his plane." Vermonters won't get a look at Beta's new aircraft until next year, but O'Leary insisted it will be worth the wait. "Electric aviation is the inevitable future. It's going to happen gradually over the next five to 50 years, beginning with short flights," he said. "This is an international business opportunity where a small company in Vermont can compete on the same playing field with the big boys." The original print version of this article was headlined "Taking Off"